One of the biggest problems that are facing us besides the extreme spike in population growth, enormous food waste and the growing demand for food resources, is the problem related to the shortage of land for cultivation. Of course, every issue I’ve stated above is directly correlated to one another, thus resulting in the increasing need for more land. However, despite the severity of these issues and their potential to create a worldwide epidemic, the positive impact of farming technology (AgTech) we’ve experienced thus far shows a few viable solutions to solve these problems. Let’s cover all the ways technology will influence the agriculture sector for the long-run. 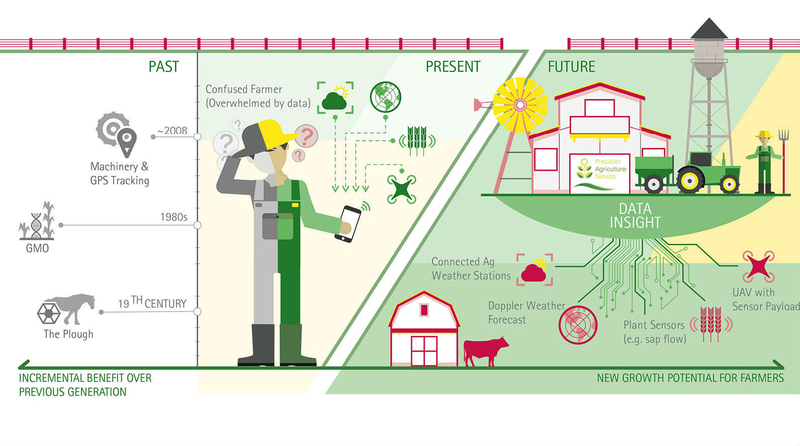 Ground-based IoT sensors will be able to monitor the nutrient levels in a field and provide growers with accurate insights regarding when and where crops should be planted to achieve maximum gain and avoid crop waste. Air-based sensors that can be equipped to drones will give farmers real-time insights on the most optimal weather conditions for planting and harvesting. This is bound to make farming processes more efficient as farmers will be required to be less timing-intensive. Plant-based IoT monitoring systems are capable of giving live feedback on the health of a plant or a group of crops altogether. This tech-driven approach will completely eliminate the time-intensive nature of manually needing to examine their crops while having complete clarity on the well-being of their farm. The overall potential of agriculture technology looks promising, especially when you consider the fact, that some farmers have already started utilizing it to increase efficiency in their work. However, global adoption is what we are after if we want huge problems such as lack of land for cultivation and increasing demand for food to be solved. But what are the current bottlenecks that prevent farmers from fully diving into adopting technology? Well, the lack of understanding of how to operate new machinery and the lack of ability to invest in getting new equipment doesn’t help. Apart from that, the average age demographic of farmers is around 58.3 years which presupposes that gaining momentum with AgTech will be a hard objective to achieve simply because older demographics are not as familiar with new tech as the younger generations. To solve these obstacles, we must bring attention to agriculture technology not only in the eyes of farmers but also to the government institutions that would be capable of helping professional growers financially at the early stage of adoption AgTech is now.